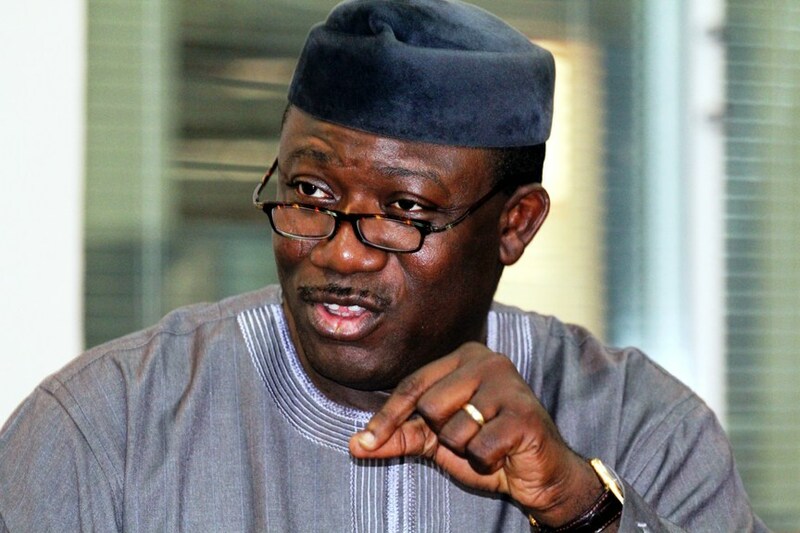 Dr Kayode Fayemi, Minister of Mines and Steel Development said that the government was likely to commence substitution or ban importation of barite for oil companies to patronise barite produced locally, according to the Premium Times of Nigeria. Nigeria’s barite sector is hoping to enter a new era of development that will enable it to compete more favourably with the dominant and superior quality barite imports. The Nigerian government recently launched its Economic Recovery and Growth Plan, of which one of its main targets is the mining sector, and in particular, the stimulation of processing and import substitution. The government is targeting strategic minerals and metals for development including barite, plus limestone, iron, bitumen, lead, and zinc, and offering tax breaks to mining companies. The initiative received a boost on 20 April when the World Bank approved a US$150m credit line to help increase the mining sector’s contribution to the Nigerian economy. Earlier this month, it was reported that Dr Kayode Fayemi, Minister of Mines and Steel Development, gave assurance to the Association of Miners and Processors of Barite (AMAPOB) that the government would find ways of convincing oil companies in the country to patronise local producers of barite to reduce importation of the product. He was speaking at a town hall meeting in Benue state, one of the key source areas of Nigerian barite. Another news report indicated that Fayemi may call on the government to reintroduce the import ban to help the local miners. Mike Mku, First Vice President, AMAPOB, told the minister that Nigerian barite was of international standard (attaining 4.3 SG) and “in abundance to sustain the oil companies”. Mku also echoed earlier appeals from the mining sector that barite imports must be banned again so that domestic producers can re-enter the market. In October 2016, Patrick Odiegwu, National Publicity Secretary of AMAPOB, appealed to the government to stop giving waivers to oil and gas companies to import barite. Odiegwu cited Sani Abacha’s regime of 1993-98 that saw the oil and gas sector source domestic barite, adding that there should be a deliberate policy to ensure that laws binding barite in the country were adequately enforced. The Nigeria Content Act of 2010 provides for the increase of local content in the servicing of Nigeria’s oil and gas industry. Odiegwu underlined that the Act backs barite development and stipulates that 60% of barite utilisation in the country must be sourced locally. Although Nigerian oil production has fallen to around 1.2m bpd from around the 2.2m bpd level of 2010-12, the OPEC producer is nevertheless Africa’s largest oil producer, and was until a few years ago one of the USA’s top import sources of oil (this maybe revived, in March 2017 the USA increased Nigerian imports by almost 300%). As with all oil and gas producing regions, Nigeria is a consumer of barite, an imperative ingredient used as a weighting agent in oilfield drilling fluids. 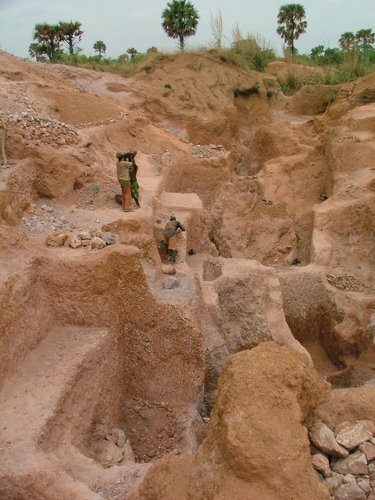 From 2003 to 2014, Nigeria had prohibited imports of barite (and bentonite) in an effort to stimulate development and use of domestic barite resources, which was met with some success although supply shortages did not endear local producers to the oilfield service majors. Limited development had taken place and oilfield service companies claimed local production struggled to meet API specifications as well as desired volumes. As a result, the oil companies applied for the barite import ban to be lifted, which occurred in 2014. In its report submitted to the government in 2013, the Committee on Waiver of the Ban on Import of Barite and Bentonite revealed that Nigeria had a shortfall of 31,318.65 tonnes of barite, against domestic demand requirements of 70,590 tonnes. The committee put the domestic production level of barite at 39,181.35 tonnes. 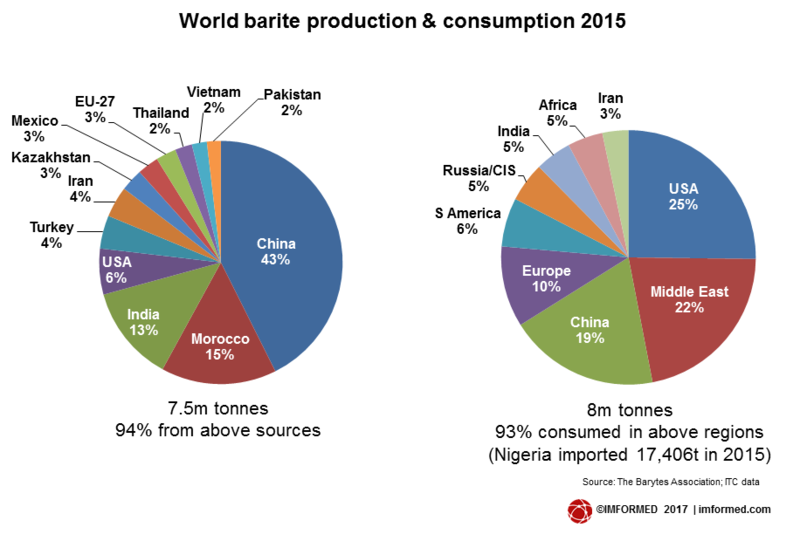 Nigerian barite imports in 2015 totalled 17,406 tonnes, mainly sourced from China, the USA, the UK, and the Netherlands (see charts for world barite production and consumption). This figure slightly exceeded the import total of 2002, while with the exception of 13,678 tonnes imported in 2012, the period 2003-2014 saw negligible import volumes as the ban was in place. Another factor facing Nigerian consumers of barite is the local bureaucracy. According to a report by Bashir Ahmed in The Cable, end users need to get approval from the Federal Ministry of Mines and Steel Development (FMMSD) before they can import barite. Similarly, the Nigerian Content Development & Monitoring Board (NCDMB) must also give its consent before importation of barite for use in the Nigerian oil and gas industry can go ahead. Another regulatory body, the Nigerian Custom Service (NCS) has banned the importation of processed barite but allows importation of barite crude ore, provided all import duties are paid. Then, at the point of importation, the National Agency for Food and Drug Administration and Control (NAFDAC) also has to inspect and certify the product before it is cleared by the NCS. The Benue Trough is a Cretaceous sedimentary basin, an elongated rift approximately 1,000km long and 50-150km wide, and is Nigeria’s main source of barite mineralisation across eight states in the north and south-east of the country: Nasarawa, Plateau, Taraba, Adamawa, Benue, Cross River, Ebonyi and Gombe (see map). Discordant, vein type of occurrence is by far (>90%) the most common barite occurrence and the veins occur in swarms ranging in width from 20cm to 6m. 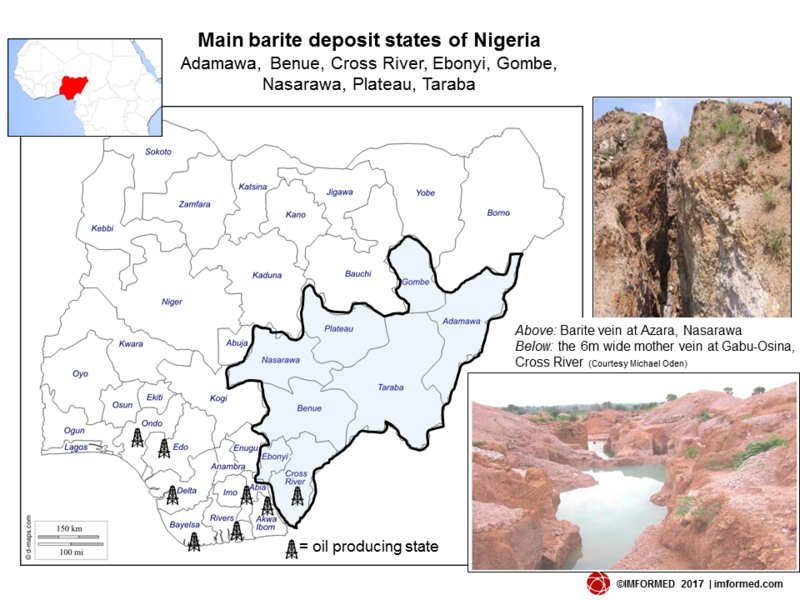 The deposits in Nasarawa state have been estimated to be 730,000 tonnes barite. Over 7.5m tonnes of barite have been reportedly identified in Cross River, Benue, Taraba, and Bauchi states. The states hosting most barite mining activity are Nasarawa, Taraba, Cross River, and Benue. There are more than 200 barite sites that have been or are being worked in the Benue Trough, and barite quality varies widely (see chart). In his paper “Barite Veins in the Benue Trough” published in 2012, Michael Oden, Dept. of Geology, University of Calabar, described the barite deposits in Cross River as “the state with the highest prospect” and which required large scale operators and further exploration work to augment the existing “enormous informal and organised mining in progress”. Cross River state claims to have the highest quality and volume of barite in Nigeria and the mineral can be found in commercial quantities in Obubra, Ikom, Biase, and Ogoja local government areas. Work in 2014 by Dominic Obi et al, Dept. of Geology, University of Calabar, estimated the total volume of barite deposits in Cross River State to be about 9.6m. tonnes. There is little or no news of established large scale commercial production of Nigerian barite. In December 2016, local barite miners in Benue state received barite earth moving equipment worth $1.284m from Chevron Nigeria Ltd in line with the company’s efforts to increase Nigeria’s barite supply capability. Chevron has purchased local barite directly from AMAPOB members including a 700 tonne purchase order awarded to Qualchem Nigeria Ltd. The latest data recorded by the US Geological Survey and the British Geological Survey lists Nigerian barite production at 10,000 tonnes in 2013 and 6,000 tonnes in 2015, respectively. A Nigerian news report in 2016 claimed the country produced >80,000 tpa barite and that domestic consumption was in the order of 75,000 tpa. There is no doubt that Nigeria is giving its barite sector a welcome shot in the arm. Whether the government reconsiders resumption of a barite import ban remains to be seen, and if it does, there may be more impetus to commercially develop the barite deposits this time around. However, as Dr Fayemi reminded AMAPOB, in order to make any headway the local miners have to prove themselves able to deliver consistently available supplies of high quality drilling grade barite. Otherwise, the oilfield majors will have to resort to Chinese and other sources.